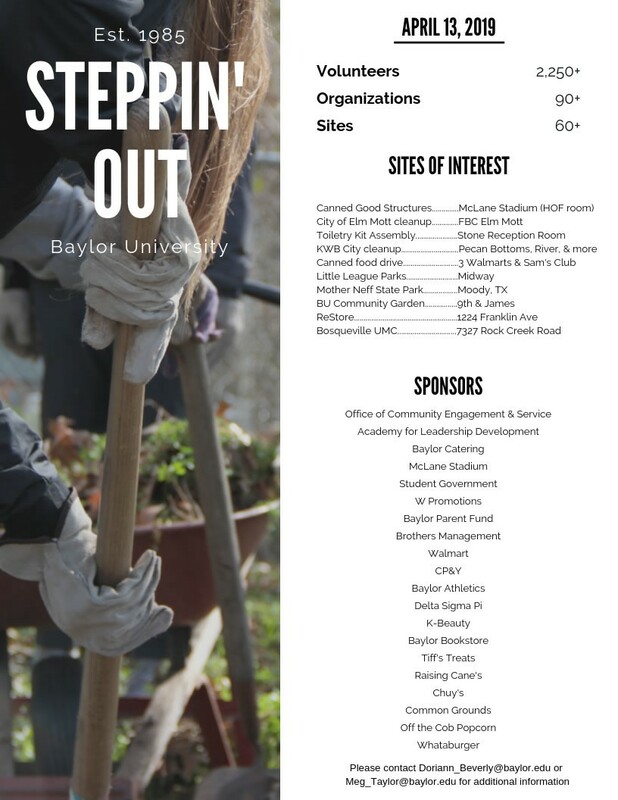 Baylor University will host Steppin’ Out from 8 a.m. to 3 p.m. on Saturday, April 13, where more than 2,300 volunteers and 90 organizations will team up to serve the Waco and Baylor communities. Steppin’ Out has been a tradition at Baylor since 1985. It is one of the largest collegiate community service projects in the United States and is nationally recognized for its commitment to service. Students will participate at more than 70 locations and work in four-hour shifts. The shifts will run from 8 a.m. to noon, 9 a.m. to 1 p.m. and 11 a.m. to 3 p.m on Saturday. One of the sites, the Canned Good Structures at McLane Stadium, will run from 8 a.m. to 4 p.m. with engineering teams building structures all day. Additional sites of interest include the City of Elm Mott cleanup, Keep Waco Beautiful City cleanup, canned food drive, Little League Parks, Mother Neff State Park, BU Community Garden, ReStore, Bosqueville United Methodist Church and Toiletry Kit assembly. The Toiletry Kit assembly will be done by student-athletes and the Baylor athletics program in the Stone Reception Room in the Ferrell Center. The kits will be provided to The Store, a food pantry on Baylor’s campus that normalizes food resources as one of the supports that students can utilize to fully thrive at Baylor. This year, volunteers will represent more than 90 student and staff organizations. Organizations include Staff Council, Leadership Living-Learning Community, Chi Omega, Multicultural Greek Council, Louise Herrington School of Nursing students and BU Meds. The goals of the planning committee and day of service event include enhancing Baylor's involvement through service to the surrounding community, increasing awareness of the needs of the surrounding community and facilitating collaboration between Baylor University and the Greater Waco community. The event is sponsored by 20 companies from the Baylor and Waco community. Sponsors include: Office of Community Engagement & Service; Academy for Leadership Development; Baylor Catering; McLane Stadium; Student Government; W Promotions; Baylor Parent Fund; Brothers Management; Walmart; CP&Y; Baylor Athletics; Delta Sigma Pi; K-Beauty; Baylor Bookstore; Tiff’s Treats; Raising Cane’s; Chuy’s; Common Grounds; Off the Cob Popcorn; and Whataburger. For more information, contact Doriann_Beverly@baylor.edu or Meg_Taylor@baylor.edu.